I have a confession. I was scared to watch The Help. Then I saw that the film was nominated for four Academy Awards, and I decided it was time to swallow my fear and watch the thing. I'm a pretty critical person (as my previous posts may have indicated) and I get very frustrated by many of the Hollywood depictions of racial controversy (you don't want to get me started on Precious or The Blind Side, for instance). I was actually pretty sure I wouldn't like this movie, but there was one thing in my mind as it started to play. We'd been talking about the film in one of my graduate rhetoric classes, and one of my classmates--a very intelligent woman whose ideas I respect--said (paraphrasing) "I went into this movie planning to be critical, but I got so caught up in the story that I don't think I was." Maybe that's what happened to me, but I was taking notes, so I have to have been at least a little critical. Still, if you tally up all the pro and con checkmarks, I come out liking the movie. I can't completely articulate everything I think about it, but here's some thoughts. I'd love (really, love) to hear what you think of it and why. I probably spent way too much time thinking about this before I watched it, and I realize that liking the story might be blinding me to some issues that I haven't fully thought through. Let me know what you think. Oh, and for the sake of simplicity, I'm going to focus primarily on the "text" of the film itself. I'm not saying that Ms. Cooper's lawsuit and the conversation over who has the authorial right to tell these stories isn't important, but I want to focus on the film as cultural commentary and as story. Facing privilege- One of the problems I had with The Blind Side was that it followed such a narrative of some compassionate white person lifting some poor black person out of the depths of his despair through sheer kindness and selflessness. I was expecting to see a version of this story in The Help, and it seems like some people feel that's what it did. I was pleasantly surprised by the nuance of this narrative, however. Skeeter (the aspiring journalist who collects the maids stories) is not--in my view--the heroine of the film. In fact, I don't think she's even that important of a character. She is a vehicle, and her role is that of a tool that's used to bridge a gap in perspectives. Yes, that bridge is necessary because of horrendous acts of racism, but her role as bridge is not in and of itself racist. Furthermore, her characterization didn't suggest to me that she saw herself as savior. In fact, when she suggested that she couldn't leave the maids to take a job in New York, they scoffed at her and told her to leave, making it clear that this was never her story or her life. Finally, Skeeter is only able to become the vehicle for this story by facing her own privilege--and her own racism. She recognizes the role that she's played in these women's lives by growing up in this town. She is often a passive participant in conversations with the other women of the town that demean and abuse the maids. Throughout the story, she discovers flaws in herself as a representative of her culture. That's work that privileged people need to--and often don't or can't--do. I was glad to see it depicted on screen. Acting Performance- Octavia Spencer and Viola Davis earned their Oscar nominations. Their work was compelling and brought the story to life. They are clearly talented actors, and their roles were complex enough to demonstrate those qualities. Even the more static roles (such as the women of the town, which were sometimes frustrating in their one-dimensional portrayals as out-of-touch and spoiled rich girls), were cast with attention to talent in mind. Themes of Isolation and Mobility- Through all that reading, I was under the impression that this would be a simple and entirely pathos-driven account of how one young white woman rallied together a group of black maids and allowed them a path to their dignity (a story I was not looking forward to seeing play out). But that's not what I saw. As I mentioned above, I didn't see Skeeter as a path or even a very active agent in the story telling. The film opens on, closes on, and is narrated by Aibileen. It is her story, and it is not a simple one. It is a story of isolation and the desire for mobility on all fronts. From the maids' accounts of gross racial injustices that they face every day to Skeeter's awkward attempts to remain close to high school friends she has clearly grown beyond to Celia Foote's heartbreaking desires to be part of the town's social scene, we see a series of women looking at life through a barrier. While, yes, the Hollywood ending might wrap that up a little too neatly, it is not the simplistic portrayal I had been groomed to expect. Portrayal of black men- The portrayal of black men was simply abysmal. They were nearly entirely absent from the film, and when they did appear it was often as violent, angry caricatures. Though the film is very female-centric, we get characterization and sympathetic views of some of the white men, but none of the black men. Minny's abusive husband, for instance, is only represented through his shouting and the objects he throws at his wife from invisible hands. The dialect- As the Association of Black Women Historians point out the dialogue in the film is not representative of real speech patterns and it helps promote a stereotypical depiction. The promotion of the film- I saved this for last because it is the one that frustrates me most. Watch this trailer for the film. Who looks like the star of that film? To me, the clear protagonist of the trailer is Skeeter. Her story of standing up to her town to write this book looks like the central focus. The maids look like pawns falling into place to help her with her story. That's not how the film unraveled at all. As I mentioned above, the story (of the film) is clearly Aibileen's and the stories of the maids are clearly their own. When they tell their stories to Skeeter, their posture, their tone of voice, and their determination make it clear that they are speaking on their own behalf's, not to help Skeeter promote her dream of journalism. Skeeter may be providing them an outlet, but--again--she's just the vehicle for a desire that is fully theirs, fully owned. So why was the film promoted so differently? 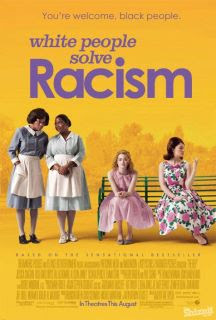 Was it because the film industry thought that selling a white woman rescuing a group of down-trodden stereotypical black maids would go down smoothly? This is related to one other concern. As much as I liked this movie, I do wonder why this is the version of the story that gets all of the attention. As others have pointed out, there are plenty of black women writing their own stories, but they're not getting this level of attention or Oscar nominations. While I think that it is perfectly valid for a white woman to write through her own perspective on race issues (in fact, I think it's important that she does), I also think it's problematic that those are the only stories that get circulated and promoted. The Help was set amongst the violent backdrop of the 1960's and Skeeter acted as a bridge to get a story that couldn't be told to the dominant society in other ways--why do we still need a bridge to hear this story today? Thank you for the post. I have not yet watched the movie based on two things: the absolutely horrible feeling I got from the trailer and the critical reviews I had read. From the moment I saw the trailer, I just didn't want to see it despite all the glowing recommendations from people I knew. You've convinced me to sit down and watch it. The parody poster is pretty funny.